Welcome to A10 Talk’s Top 14 Coach Countdown of the 2016-17 season. We like to rank the players of the A-10 each season, but we’d also like to take a look at the brains of the operations. Who were the best coaches of the 2016-17 season? Who were the worst? Our site voted and compiled a list based on last season alone. This list is representative of how well each coach performed in the 2016-17 season, not in his entire career. Today, we feature #12 Jeff Neubauer. 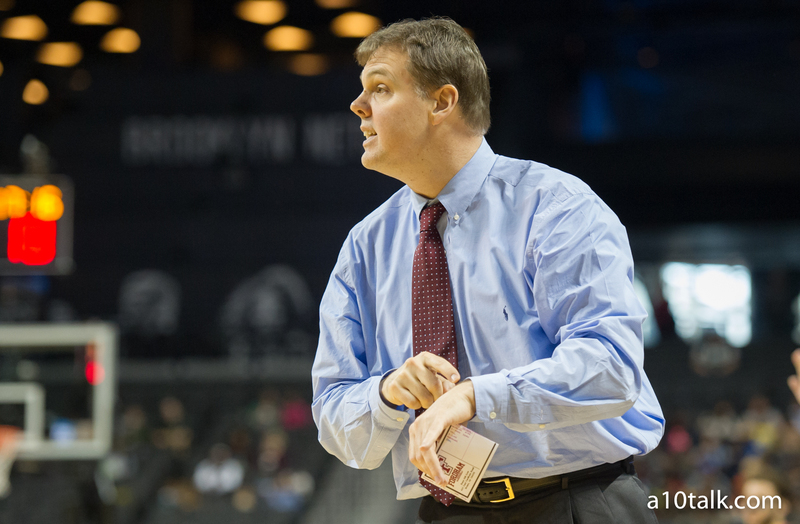 Jeff Neubauer had his ups and downs as Fordham’s head coach in 2016-17, but his best moments came when his team was playing good defense. Take a 53-43 road win over Rhode Island for example. The Fordham Rams stole the show and allowed only 5 points in the final 10 minutes. Jeff Neubauer’s defensive game plan stifled a Rhode Island offense that had been one of the best in the league. The Rams had no answer. Wins like this one not only gave Fordham some confidence, but they might have saved Jeff Neubauer’s job for a few more seasons. The two-year head coach has had his fair share of struggles, but there are definitely positives to take away from his coaching. He has coached his way to some big wins in Atlantic 10 play. Fordham made one heck of a stride to beat VCU in conference play, and credit the head coach for helping his team win that game. Again, Fordham has had its fair share of bad losses, but a couple of good wins help counterbalance that. What separates Jeff Neubauer from Jim Ferry or Derek Kellogg was his closing ability. Neubauer could coach in late game situations and help his team pull out some unlikely wins. While it wasn’t a season to be remembered at Fordham, there were certainly memorable moments, like this one. A 6 game losing streak in non-conference play is never something that looks good on a team’s resume, especially when you’re playing sub-par teams like Sacred Heart and Manhattan. Quite frankly, I was surprised that Jeff Neubauer was able to pick his team up and win 7 conference games after this brutal showing. This team looked distraught after a home loss to Sacred Heart, a team that Kenpom ranked 301 overall last season. But again, Neubauer stuck to his guns and found a way to at least exceed low expectations in conference play. He didn’t let his guys quit or give up on a season that probably wasn’t going to end on a happy note. According to Kenpom, Fordham had a 98.1% chance of finishing this game with a win when there was just over a minute left. Unfortunately, the Rams folded in the final seconds and allowed for a spirited George Mason comeback. That’s on the coach. Jeff Neubauer did not implement a good defensive game plan in the final minute of regulation, and allowing the Patriots to get what they wanted at the rim, Fordham would lose this game. This was simply Jeff Neubauer getting out-coached, and it hurts because Fordham played so well for the first 39 minutes. it’s moments like these where you realize there are still strides to be made if you’re Fordham. With a number of transfers leaving the program, you can’t help but wonder if this Fordham team can even finish 13th in the league. This roster is almost depleted, and Joseph Chartouny is going to be the only true returning stud. Jeff Neubauer had things moving in the right direction this season, but next year could be an enormous step back. He’s going to have to get crafty and find a way to win some A-10 games with a lot of new faces. I am not sure how much higher I would move Neubauer but I think 12 is low given how well Fordham played at times. I think he did an excellent job putting the Rams into positions where they could win. It stinks that they are loosing so many starters to graduation/transfer but I think Neubauer has the program headed in the right direction which is a huge step forward for Fordham. This past Fordham season reminded me a lot of Bonaventure circa 2009-10, not able to pull out some close games but a jump in quality of play, the difference being the Bonnies were a young team with most of its core coming back the next season. Yes, if the rankings are based on this year not sure why Neubauer’s is 12th. Second year in a row Fordham finished higher than media and coaches’ poll. Yes a bad OIC stretch, during which Chartouny went down and missed games than clearly played hurt. Havsa, Ohams and Bunting all played well during the mid season winning stretch, and Slanina was coming around when he got hurt. Hicks never played and he’ll be a good addition, and they just signed Tre Evans. If Travis Ford is placed ahead of Neubauer, or Martelli, the reasoning doesn’t seem to actually be based on this year alone. Slanina was a big part of some wins. Went for 10 and 8 against Davidson. 15 and 5 with 2 blocks against Saint Joseph’s. 13 and 7 against UMass. He went down in the 1st La Salle game. Chartouny went down in the middle of the 1st half against Sacred Heart. Still a bad loss. He missed the Harvard game then he was clearly still hurt against St John’s and Manhattan (0-15 in those games). And Chartouny missed the Rhode Island, Saint Louis and Duquesne win streak. So they did that with Slanina and Chartouny out, 2 starters. Neubauer had other guys step up, though. In the Duquesne win Havsa had 10 points in 20 minutes on 4 of 5 shooting. Tavares went for 7 and 5 on 3 of 5 shooting with 4 assists, a block and a steal. Ohams went for 4 and 7, a block and a steal. Bunting played 19 minutes, 3 and 2, and a block. In the earlier saint Joseph’s win Tavares went for 10 and 5, a block and a steal. Bunting didn’t play in regulation, then put in 6 in OT when called on due to foul trouble. Havsa went for 12 in the GW loss, making 4 3 pointers in a row late. In the La Salle loss to end regular season, Hawkins and Slanina both out, Ohams went for 12 and 7 and 2 blocks. Havsa had 6 assists and 1 turnover. Sure everyone loses players. Hicks missed all season. Pekarek and Zarkovic, who had started or played starter minutes during some big wins in 2015-16, each tried to play hurt and missed half the games (the team had a winning A-10 record of 6-5 with Pekarek as a starter in ’15-’16). Slanina half the conference season. Chartouny got hurt, then missed games for personal reason when his grandfather died. Hawkins missed a game. Anderson played with a sprained ankle. Still people stepped up, including Havsa and Ohams, who were freshmen who didn’t play much early. The OOC losing streak is partly ion Neubauer, but as noted he righted the ship. And despite graduation and transfers, the good thing about all the injuries is that various guys got to play significant in important wins. Tavares was a bit disappointing this year, but played a lot and had his best games in a couple of wins. Ohams played a lot as conference season wore on, and rebounded well, dealing with the likes of Allie-Cox in the VCU win. Slanina played well until he went down. Even Bunting played well as a reserve in a limited role (by advanced metrics he was actually one of the better players on the team). Havsa played a lot late in the year and was a good passer. And Pekarek and Zarkovic played a lot during the win streak that ended 2015-16. Of course I am cherry picking good games. All these guys need consistency. I doubt recruiting is done. But with Hicks recovered, Evans coming in, Chartouny and Havsa, and a healthy Zarko as a reserve, the backcourt seems fine. Up front, Slanina and Ohams, and Bunting in reserve, and hopefully Pekarek bounces back. He regressed. They will need help. Probably will go 3 guard a lot. I actually like Saglam, who barely played, but I think he will ultimately impress like fellow Turk Havsa. He’s got some bounce to his game. May take another year or so. I expect 2nd year improvement from Slanina and Ohams. Sure, they lose a lot of scoring from a weak scoring team. Hopefully Evans isn’t the last signee for this year. But the returnees got to play a lot in some big games. Obviously, no one else is standing still. But I think for a 3rd year in a row, Neubauer will get the Rams to outperform the A-10 projections.